WASHINGTON– Oct. 7, 2016 – Boeing [NYSE: BA] and Qatar Airways announced an order for 30 787-9 Dreamliners and 10 777-300ERs, valued at $11.7 billion at list prices, validating the value, reliability and performance of Boeing’s twin-aisle airplanes. The airline also signed a Letter of Intent for up to 60 737 MAX 8s, valued at $6.9 billion at list prices. Pictured here is the Boeing 737 MAX 8 in Qatar Airways’ livery. WASHINGTON, Oct. 7, 2016 /PRNewswire/ -- Boeing [NYSE: BA] and Qatar Airways announced an order for 30 787-9 Dreamliners and 10 777-300ERs, valued at $11.7 billion at list prices, validating the value, reliability and performance of Boeing's twin-aisle airplanes. Today's announcement builds on Qatar Airways' current fleet of 84 Boeing aircraft, a combination of 787s and 777s, all delivered over the last nine years. With this new order, Qatar Airways increases its firm order backlog of Boeing widebody airplanes from 65 to 105, including 60 777Xs. The announcement was attended by the State of Qatar's Minister of Finance, His Excellency Ali Shareef Al Emadi, U.S. Deputy Secretary of State Tony Blinken and the Ambassador of Qatar, His Excellency Mohammed Jaham Al-Kuwari. "Qatar Airways, already one of the fastest growing airlines in the history of aviation, today announces a significant and historic aircraft order that will power our future growth for the years and the decades ahead," said Qatar Airways Group Chief Executive, His Excellency Mr. Akbar Al Baker. "Boeing has proven to be a valuable partner, and today's announcement is testament to our appreciation of the quality of their product and their dedication to providing world class customer service." Qatar Airways' relationship with Boeing was renewed in 2006. Since then, there have been many milestones in the partnership. The airline was the first to operate the 787 in the Middle East and is a launch customer for the 777X. With the commitment for the 737 MAX 8, it would be the first Boeing single-aisle airplane model to join Qatar Airways' fleet in more than 15 years. "Congratulations to The Boeing Company and Qatar Airways on the remarkable milestone they've reached, which will significantly grow the number of Boeing aircraft in the Qatar Airways fleet," said U.S. Secretary of Commerce Penny Pritzker. "Beyond its importance for these two companies, this agreement demonstrates the importance of global commercial partnerships in strengthening our bilateral ties. This deal will strengthen economic opportunity and job creation, and highlights the importance of strong global trading relationships." "We are so very proud that a discerning and market-leading customer like Qatar Airways not only continues to endorse our current products, but also has confidence in Boeing's new technology that will soon be evident on the 777X and 737 MAX," said Boeing Commercial Airplanes President and CEO Ray Conner. 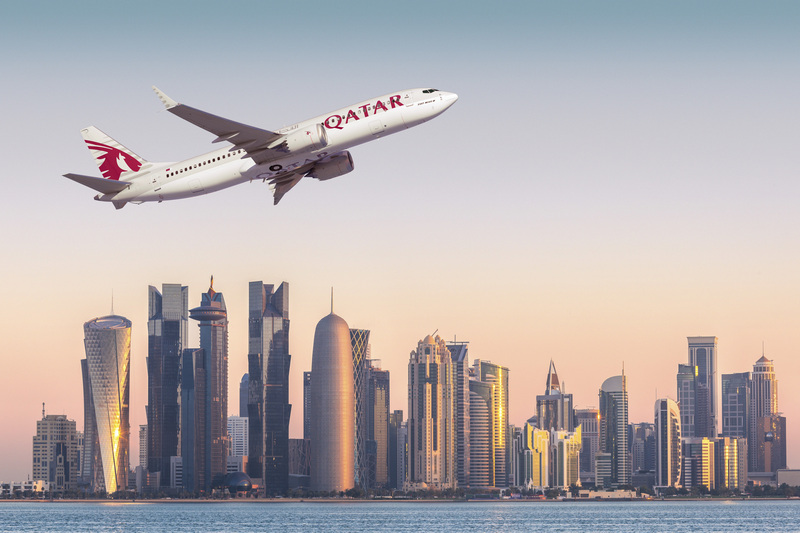 "Our partnership with Qatar Airways has grown and strengthened tremendously over the years and I look forward to the time when its fleet will feature an increasing number of both our single and twin-aisle airplanes." The 777-300ER is the most reliable twin-aisle airplane flying today and is considered to be the flagship of the world's elite airlines. It has the highest schedule reliability of any twin-aisle airplane at 99.5 percent – the airplane is on time, nearly all the time. The 787-9 Dreamliner is the second member of the super-efficient, passenger-pleasing 787 family. The 787-9, a stretch of the 787-8, can fly 290 passengers 7,635 nautical miles (14,140 km) in addition to more cargo, allowing airlines the ability to grow routes first opened by the 787-8. Boeing's newest family of single-aisle airplanes – 737 MAX 7, 737 MAX 8, 737 MAX 9 and 737 MAX 200 – builds on the Next-Generation 737's popularity and reliability while delivering customers unsurpassed fuel efficiency in the single-aisle market, with deliveries scheduled to begin in 2017.